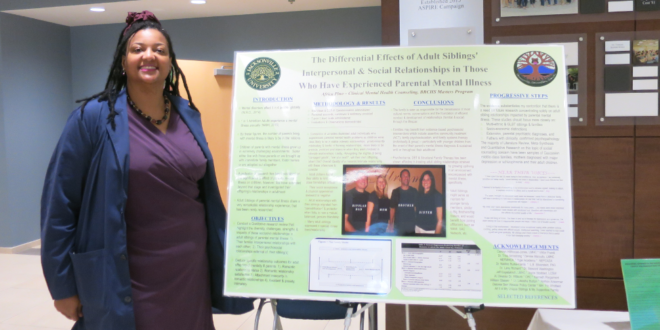 Africa presents her research poster at the first Clinical Mental Health Counseling Internship Fair on Thursday, July 28. Why did you choose this JU program? Its reputation and long history in the community. I wanted the experience of a classroom setting to accompany the online instruction. I explored some other programs that were strictly online, and I felt such an interfacing, personal profession as counseling warranted the same type of learning to best emulate the required skills and competency that this industry and client population deserves. The expertise I am receiving from the professors; their vast experience, guidance and, most of all, their concern for us learning the material, doing well and always encouraging excellence from us. The other feature about this program is the ample community involvement; we are persuaded to become involved with and are exposed to, just as student counselors, professional affiliation/chapter meetings, job shadowing, workshops, conferences, lectures, (active) licensed mental health counselor (LMHC) guest speakers/presenters, therapy observations, focus group and symposium participation, research, think tanks and an abundance of networking opportunities. As a student, you receive a continuous look at what counselors do, from various specializations and categories; there’s not any waiting until you graduate (or even until your practicum begins, for that matter) before you have thorough detail of what this profession does and how you can see yourself integrated within it. I strongly think this approach to academics is far more conducive to absorptive learning than classroom alone. The workshops and conferences combined with engaging classroom experiences help us visualize how to apply the concepts and modalities in a real-life setting. 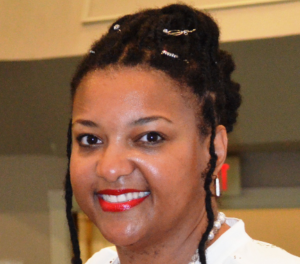 The entire educational experience has been extremely reinforcing and motivational; I think an incoming graduate student counselor will find these exposures very important to their learning process and acclimation into the counseling profession. What made you choose to pursue a career in this area? Familial relations. I think my experience with childhood trauma and family mental illness allows me to identify and better understand others who are living through and with similar circumstances. I want to work in a community agency (preferably including an at-home component) with families affected by severe and persistent mental illness (parents) that have a child(ren) who has been removed from the home due to their parent’s diagnosis. I’d like to help the entire family (and extended members this inevitably will affect) become educated (using Child-Parent Psychotherapy), reunify (when possible), cope, heal, achieve (attempt) pathology remission, and eventually thrive from this traumatic, life-changing event.